The Moto G2 looks set to release fairly quickly after the event this Thursday where it should be unveiled. After a picture surfaced today of the Moto G2 retail packaging, it was certainly looking like the phone will be released to stores not longer after it’s announced. Adding even more to that theory is a new shipping manifest for a shipment of 70,200 units heading into India. 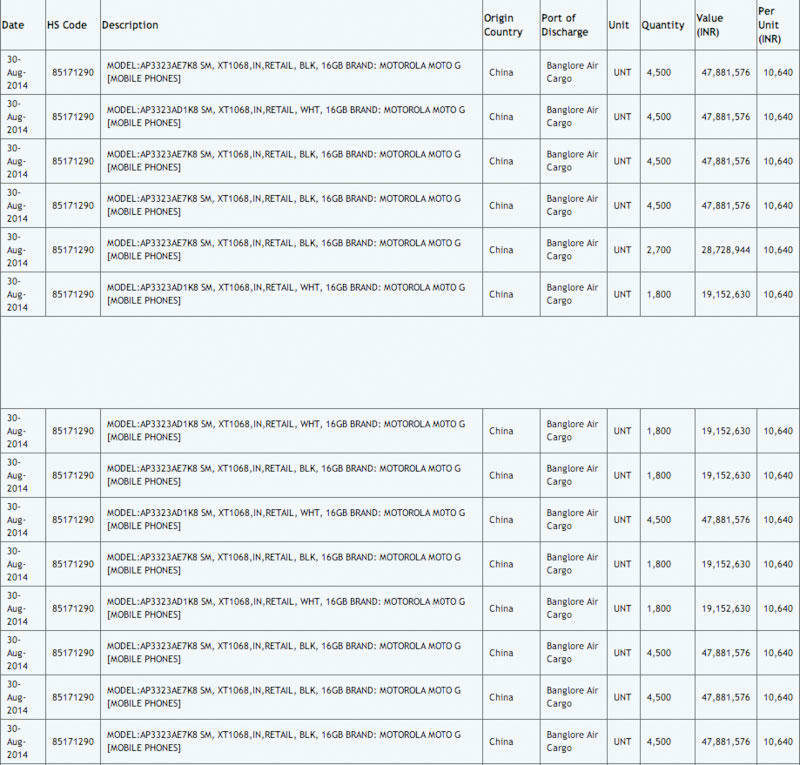 The Indian import/export database Zauba shows a large shipment of “MOTOROLA MOTO G [MOBILE PHONES]” making their way into India on Aug. 30. While the document it only lists it as the Moto G, the model number is shown as XT1068, which lines up with the rumored model number for the Moto G2. While foreign prices don’t always line up across all territories, it is interesting to note that the Moto G2 is listed at Rs. 10,600 (approx. $175 USD), which is lower than the value listed for the current Moto G at Rs. 10,900 (Approx. $180 USD). This certainly implies that the new model will be cheaper than the previous version, which is always a welcome change. The Moto G2 is expected to feature a Snapdragon 400 processor, 8MP rear camera, dual-SIM support and a 5-inch 720p display. Motorola will be hosting its event this Thursday in Chicago where we also expect to see the Moto X+1. TechnoBuffalo will be in attendance, so make sure to check back in for all of the coverage.